Incredible view of Mount Manaslu and other some of the highest peak of the world. Larkya Pass; The highest vantage point in Manaslu. Peaceful environment with beautiful landscapes. Experience of Tea Houses and Camping in Himalayas. Suspension Bridges and the cold streams. The Manaslu Circuit Trek is the newly discovered trekking trail full of adventure. Manaslu Circuit Trekking is getting more and more popular day by day. The circuit is a stunning trek with spectacular views of Mount Manaslu and Ganesh Himal Range, among others. Along the trail, one can observe the cultures and traditions of Hindu and Tibetan style Buddhists peoples. Manaslu trekking exhibits the sensational mountain vistas, fascinating culture and biological diversity spanning altitudes from 600 to 5200 meter. This Manaslu Circuit Trekking suits best to those who are looking for challenging but less trodden trekking in Nepal. The Manaslu Trek is one of the restricted region trekking in Manaslu Region can be done in two weeks, where all nights are spent by camping. This is also becoming the best alternative route of Annapurna Circuit due to the road construction on the some section of Annapurna region. Trekking trail to Manaslu is far less crowded than other classic treks in Nepal and remains a true remote adventure. Now days Tea houses are building on the route which makes our trip comparatively easier. 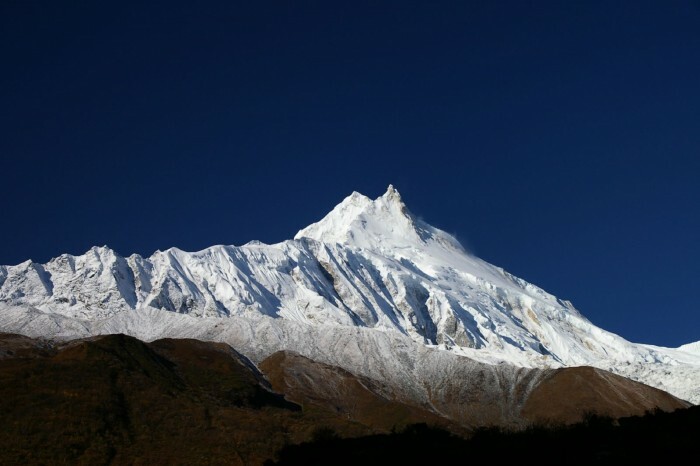 Manaslu literally means ‘The spirit mountain’. Trekking to Manaslu offers great view of some of the highest mountains in the world. The trek exhibits the unspoiled diverse culture and traditions with the incredible views of mount Manaslu. The suspension bridges and beautiful forests are the attraction of this trek. The Larkya Pass ( 5125m) is the highest vantage point in the Manaslu Trek. This is classic and ancient salt trading route that links the Budigandaki with Marsyangdi valley, literally Manaslu to Annapurna region. The view from the Larkya pass is just superb with Chuli, Himlung, Cheo Himal Annapurna II and Mt. Manaslu. Passing Larkya Pass can be tough when there is snow. The whole trail offers you the great views of mountains and gives opportunity to experience the beautiful Nature. Manaslu Circuit Trek is open from 1991 for trekkers, which is being very popular trekking destination. Manaslu Circuit trek is the best alternative of Annapurna Circuit Trek. Spring and Autumn are the best seasons for MAnaslu Circuit Trek. During spring, March, April, and May are best months for trekking as in these months you can see the clear views of Mountains with full of snow. Spring is also the season of Rhododendron, you can find all the forests full of beautiful red rhododendrons. Another best season is autumn. September, October and November are the perfect months for this trek. In these months, you can experience the majestic view of Himalayas and experience the culture of local peoples as this is the season of biggest festival of Nepal. We will be there at Tribhuwan International Airport for your warm welcome and to transfer you to the hotel. There in the hotel will be short briefing. You can relax in the hotel or go for shopping in rest of the day. Overnight stay in Kathmandu. Day 02: Drive from Kathmandu to Sotikhola [710m] 8-9 hours. We start our journey early in the morning.During the drive we will enjoy the beautiful views of landscapes and great views of White Mountains. We will reach Arughat by passing through the Dhading Beshi. After reaching in Arughat, we continue our trip towards Sotikhola. Overnight in Sotikhola. Day 03: Trekking from Sotikhola to Machhe Khola [900m]. 6-7 hours. After crossing the bridge, we trek through the beautiful Sal forests. Passing the rocky trail, streams and the beautiful water falls, we reach to the Gurung village of Labubeshi. We further climb behind the rocky outcrop, where the valley opens. Dropping to the sandy river bed of KaliGandaki, we walk along rounded stones before climbing over a side ridge. Again we head down to the river and cross suspension bridge and finally reach MachhaKhola village. Overnight stay in MachhaKhola. Day 04: Machha Khola to Jagat [1410m].6-7 hours. We head through the narrow trail making minor ups and downs and crossing streams. After few more ascends and descends we come across small naturally hot spring in Tatopani. From the Tatopani, we climb over another ridge and then cross Budi Gandagi on a suspension bridge. Climbing up the stone staircases and crossing the streams we reach to the Jagat Village. Overnight stay in Jagat Village. Day 05: Jagat Village to Deng [1804m] 6-7 hours. Today we climb over a rocky ridge to Salleri, and then descend to Sirdibas. We continue walking upstream to a long suspension bridge in Philim, a large Gurung Village. The trail goes through millet fields and grassy land slopes. We cross BudiGandaki and then trek along the west bank for a while, then cross to the east bank and back again. We pass through the bamboo forests to the Deng Khola. After crossing the Khola we will reach toi the tiny village Deng. Overnight stay at Deng. After a brief walk beyond Deng, we cross BudiGandaki and climb up to Rana. The trail passes through forests and Mani walls. Even though there is an another route, we choose the way to Prok village, which has a view point for the beautiful sight of Siringi Himal. We further cross the Budigandaki several times today. The pleasant walk through the gorge and beautiful forest continues and after a last steep climb we reach to Namrung for overnight stay. Day 07: Namrung to Samagaon [3530m] 6-7 hours. Today we trek over a windy path which moves through the inner Himalayan range. Namrung village is a good view point for Siring and Ganesh Himal and from the village, one can also see mount Himal Chuli in the south. Climbing steadily and passing through the forests we reach Lihi; a beautiful village. From where we can get the close view of Ganesh Himal. From Lho village we can enjoy extraordinary views of Mount Manasly and also explore the famous Ribung Gompa. In shyala village we will be surrounded by high mountains like Himalchuli and Peak 29 (Ngadi Chuli). Today’s journey ends in Samagaon. Overnight stay in Samagaon. Day 08: Samagaon to Samdo [3860m] 4-5 hours. Firstly we descend to the Budhigandaki River. Following the trail, passing several mani walls we reach to the valley. It is an easy trail as compared to previous days. We pass through the forests and streams and the Kermo Khaarka. From the stone arch we will view a large white kani and pasing through kani we will reach Samdo. Overnight in Samdo. Today is the day for proper acclimatization. Today we have two options but we recommend you to hike up the valley directly at the back of the Samdo village. This will take us to the one of the trade passes to Tibet for excellent views of Mt. Manaslu and other high mountains. En route these viewpoints we pass many seasonal herding settlements called doksas and sight some beautiful mountain birds like Lophophorous . Another option for today could be the trip to Gya La pass to the north of Samdo, a more frequently used trading route to Tibet. This is a quite longer hike.Overnight stay in Samdo. Day 10: Samdo to Dharmashala [4460m] 4-5 hours. Today also we continue our walk down the edge, cross the wooden bridge over Budi Gandaki and start walking upward. After crossing two streams and witnessing the Larkya Glacier we go around the valley of Salka Khola and climb up to the Dharmashala also called Larke Phedi. Today we will have short walk and plenty of time left for acclimatization. Overnight stay in Dharmashala. Day 11: Dharmashala to Larkya La [5160m] to Bimthang [3720m] 8-9 hours. After a short climb we will reach to north side of Larkya Glaciers from where we can enjoy the great views of Cho Danda and Larkya Peak and finally we walk across moraines of the glacier. Experiencing the outstanding views of Himlung Himal, Cheo Himal and the huge Annapurna II we reach to Bimthang. Overnight stay in Bimthang. Day 12: Bimthang to Tilije [2300m] 5-6 hours. Today we descend further crossing the high pasture followed by a bridge over Dudh khola. We walk through the Rhododendron forest and highest cultivated land of the valley, 2785m. After Passing the beautiful village Gho we reach to the Tilije. We might take rest at Gho because of yesterday’s tiredness but better Lodges are available at Tilije, so we recommend you to rest in Tilije. Overnight in Tilije. Day 13: Tilije to Tal [1700m] 5-6 hours. Today we climb over a small ridge and enjoy the stone paves trail which goes through the beautiful village. After crossing the bridge over Dudhkhola we climb up through the chorten-shaped arch, pass maniwal to reach Thonje village. Then we pass through the police checkpoint to Dharapani. From here, we have entered the Annapurna Circuit section. Crossing some suspension bridges and Mani walls, we reach to the village; Tal, situated at the foot of large waterfall .Overnight stay in Tal. Day 14: Tal to Syange [1080m] 6-7 hours. We follow the route to Chyamje crossing the Marsyangdi Khola. The trail then descends through the Rhododendron and Pine forests to the Syange. Overnight stay at Syange. Today we drive from Syange to Kathmandu via Besisahar enjoying the both hill and mountain landscapes. We also drive by some beautiful villages with farming terraces on both sides of the road. We can relax in the hotel room in Kathmandu, or go for shopping. We will stay in Kathmandu Today. Today your adventurous trip ends. We will drop you to the airport before 3 hours of your scheduled flight. We will be there to wish your good journey with the hope of seeing you again.